The DNA Nucleotides Tuning Forks are a set of 4 forks, one for each mid-range tone (C#) for each nucleotide of the DNA. When looking at the data of frequencies, the C# falls right in the middle of the scale when you arrange them from low to high all the other pitches of each DNA nucleotide revolves around it. 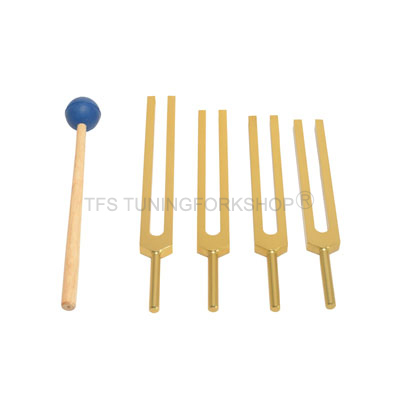 The DNA Nucleotides Tuning Forks are a set of 4 forks, one for each mid-range tone (C#) for each nucleotide of the DNA. C# is the pivot pitch, or perhaps even the master tuner. Deoxyribonucleic acid (DNA) is a nucleic acid that contains the genetic instructions used in the development and functioning of all known living organisms and some viruses. The main role of DNA molecules is the long-term storage of information. These DNA nucleotide tuners are carefully constructed to activate body chemicals that are the very essence of life - Cytosine, Thymine, Adenine and Guanine. These tuners help recreate an ancient form of gene therapy.